I have many blessings when it comes to my dogs including the desire to scarf down their dogfood but a primary one is working with a good breeder. They must be sick to death of my phone calls and questions but there are always supportive and answer or return my calls immediately. My breeder is especially concerned about dogs torsioning due to handlers being unaware of dogfood issues. When I bought my most recent partner, the breeder was very specific about prepping the kibble to protect against gas and bloat. He directed me to soak the kibble in warm/hot water for several minutes, stirring to remove gas bubbles and allow for swelling before the dog ate it thus preventing issues in the dog’s stomach. I thought this was over kill until I tried it with several different brands of dogfood. The amount of gas put off by 2 cups of food would fill a soda bottle. Imagine what that would do to any dog’s stomach? The clue was using hot water. I always used room temp water and didn’t see any gassing, but simulating the temperatures in the dog’s stomach was a whole different story. Something of a mentos and diet coke phenomenon. This still didn’t register and I continued to use room temperature water until.. Well, keep reading. I use a good quality kibble ( dogfood) and there wasn’t any swelling of the pellets. A few minutes of stirring removed gas bubbles, so I thought I was pretty safe. My old dog was on the weight control version of the same food and I didn’t think to test hers beyond a couple of minutes. One of the other blessings I have is a high food drive dog. My guy learns swiftly if a treat is to be had. Last week that also became a curse. He is good at opening action packers where the dogfood is stored so they are bungee’d shut. His was carefully closed. My old dog’s weight control food was not bungee’d. While I was out laying tracks, my young dog helped himself to several cups, probably 6-8, of weight control kibble, dry dogfood from the bag. As the day progressed his stomach swelled extensively and he was rushed to the vet’s. It turned out well and on the way home he vomited up probably about 6 cups of what he had eaten. That was an eye opener. The kibble had swollen significantly. It you look at the picture, the kibble on the left has been soaked in hot water for 10 minutes. 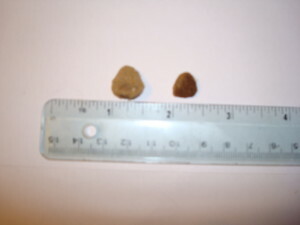 The kibble on the right is the same food in the dry state. It has increased in size about 1/8 of an inch. Now think about it doing this in your dog’s stomach. Scary. This is a very high quality, expensive kibble. So I would suggest you listen to what my breeder said and take some kibble, soak it in warm water for 10 minutes and see what how much it changes. If you change formulas or flavors in the same line, don’t assume the results will be the same – test it before you feed it to your dog. Thankfully, this line of German Shepherds are durable. Other than an upset stomach and a strong desire to sleep, my young guy weathered the disaster of eating the equivalent of 12-16 cups of dogfood without a lot of issues. I was very blessed. I would rather your dog and you not be tested by your brand of dogfood.